Previous lap record set by Rothmans Porsche 956 factory driver Stefan Bellof. 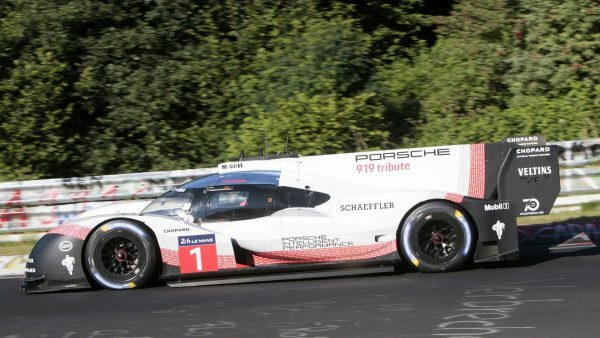 Porsche and German driver Timo Bernhard now holds the ultimate lap record around the 20.832km Nürburgring Nordschleife circuit. Last Friday, Bernhard drove one of the works team’s Porsche 919 Hybrid Evo LMP1 sports cars around the formidable circuit in a time of five minutes and 19.55 seconds at an average speed of 233.8km/h. Bernhard beat the previous lap record, set by Rothmans Porsche 956 factory driver Stefan Bellof, by 51.58 seconds. Bellof set his record on May 28 in 1983, during the Nürburgring 1 000km World Sports Car Championship race. That meant his outright Nurburgring lap record stood for 35 years and 31 days. 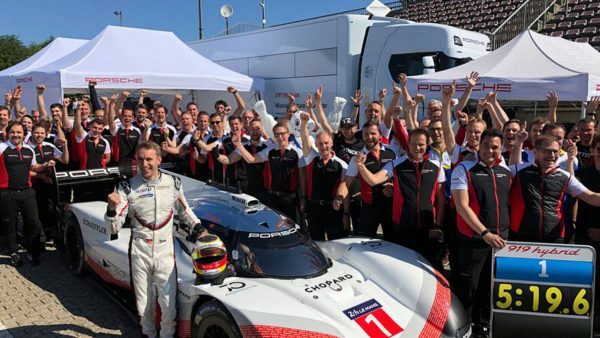 Timo Bernhard, five-time overall winner of the Nürburgring 24-hours, two-time outright winner of the Le Mans 24 hours and reigning World Endurance Champion with the Porsche 919 Hybrid, was ecstatic after the record run. “This was a great moment for me and the team – the 919 programme’s icing on the cake. “The Evo was perfectly prepared and I have done my best on this lap. “Thanks to the aerodynamic downforce, at sections I never imagined you can stay on full throttle. I am pretty familiar with the Nordschleife, but today I got to learn it in a new way”, said the 37-year-old. He is a huge admirer of Stefan Bellof. On April 9 this year in Spa, the dramatic evolution of the threetimes Le Mans winner lapped quicker than a Formula One car with Neel Jani at the wheel. The 34-year old Porsche works driver from Switzerland set a lap of 1 min 41,770 seconds around the 7.004 kilometre Belgian Grand Prix circuit. That topped the previous track record, set by Mercedes’ Lewis Hamilton in 2017, by 0.783 seconds. The Evo version of the Porsche 919 Hybrid is based on the car that took outright victory at the Le Mans 24-Hours and won the FIA World Endurance Championship in 2015, 2016 and 2017. It has been freed from the restrictions previously determined by World Endurance Championship regulations. Thus, its hybrid power train now develops a system output of 920 kW. The Evo weighs 849 kilograms and its modified, active, aerodynamics generate over 50 per cent more downforce compared to the WEC model. Its top speed at the Nürburgring was 369.4 km/h. Fritz Enzinger, Vice President of the Porsche LMP1 department, said: “We did not want to see the most innovative race car of its time disappearing unceremoniously in to the museum. Major changes from the Le Mans car included the two-litre V4 petrol engine which, without fuel-saving restrictions, kicks out around 600kW. Likewise, the car’s battery-powered electric motors now produce about 40kW more than before. The engineers also unchained the aerodynamics of the 919 Evo from the WEC regulations. The new larger front diffuser now balances the new and very large rear wing, aided further by side skirts. In total the aero modifications resulted in 53 per cent higher downforce and an increase in efficiency by 66 percent. Compared to the car in conventional race trim, the dry mass was reduced by 39 kilograms to 849 kilograms. Finally, Michelin developed special tyre compounds for the 919 Evo that produces more downforce than a Formula One car. 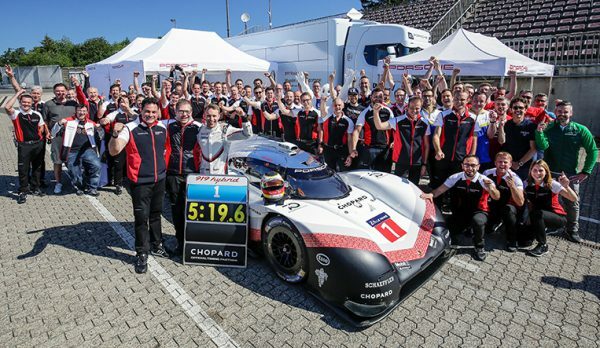 The run at the Nordschleife closed the chapter of chasing records with the Porsche 919 Hybrid Evo.